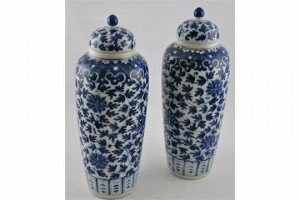 A pair of Chinese late 19th century blue and white lidded baluster vases, decorated with floral design and geometric patterns. 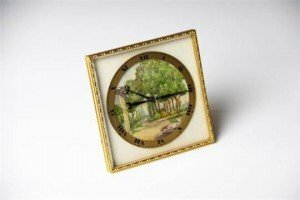 An early 20th century continental gilt brass dressing table clock, the painted ivory dial decorated with an Italian villa and garden, with gilt Roman numeral chapter ring. 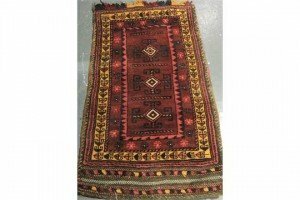 A Turkish handmade Anatollian kilim dark red ground saddlebag with a woven central geometric panel. 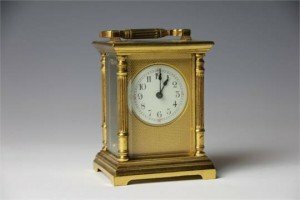 A late 19th century French lacquered brass carriage time piece, enamel Arabic dial within an engine turned brass mount, the case with fluted corner pilasters. 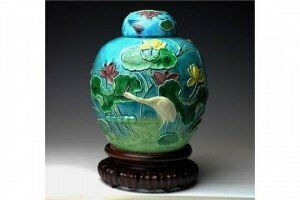 A Chinese Wang Bing Rang ginger jar and cover, moulded with flowers and a wading bird against a green ground, on a hard wood stand. 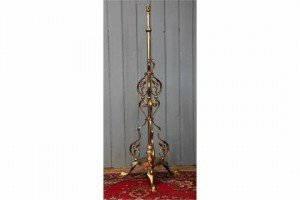 An Art Nouveau brass telescopic standard lamp, with foliate tri-form stem and scroll feet. 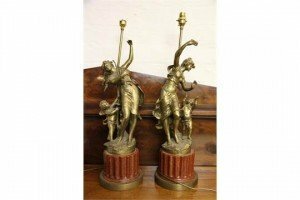 A pair of mid 20th century French gilt brass table lamps, modelled with maidens and cherubs, on fluted red pottery bases. 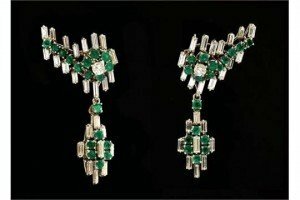 A pair of contemporary 18ct emerald and diamond pendant earrings, each of abstract foliate design, claw set, with baguette cut diamonds and emeralds, with a single brilliant cut diamond to the centre, stamped 750 18 carat. 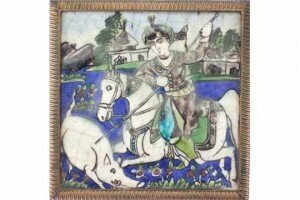 A 19th century Persian earthenware tile, decorated in relief with a huntsman on horseback hunting a wild boar, in brass frame. 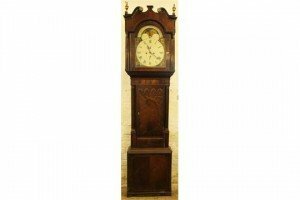 A George III mahogany eight day long case clock by Richard Fletcher, Chester, painted Roman numeral dial, with subsidiary seconds, date dial, the corners emblematic of the seasons and all below a mechanical moon phase, inlaid door flanked by fluted and turned columns, on bracket feet. 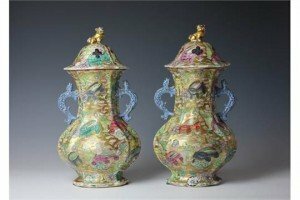 A pair of Chinese twin handled vases and covers, with clobbered decoration, with temple dog finial and decorated with animals and flowers. 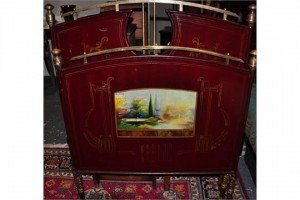 A early 20th Century French metal single bed frame, the brass mounted head and footboards painted with landscapes. 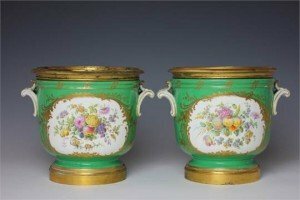 A pair of 19th century Sevres style ormolu mounted wine coolers, each finely painted with flowers within raised gilt cartouches and against a green ground, with twin scroll handles. 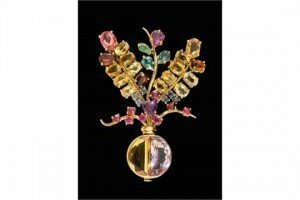 A multi gem set giardinetto brooch, by Mingardo, claw set with oval shaped stones including citrine, garnet, amethyst, sapphire, ruby, tourmaline and emerald, the vase half of amethyst and half of citrine. 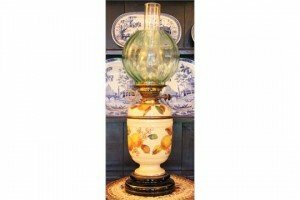 A late 19th century ceramic oil lamp, pale green shade with a vase shaped body decorated with fruit blossom. 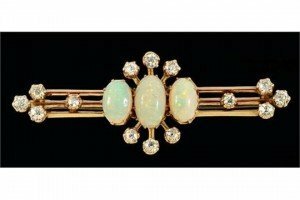 An Edwardian opal and diamond bar brooch, the centre claw set with three cabochon opals within a frame of circular cut diamonds with similar termination. 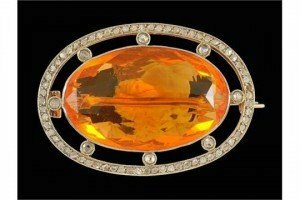 An Edwardian fire opal and diamond brooch, collet set with an oval shaped fire opal within an openwork frame mille grain with rose cut diamonds. 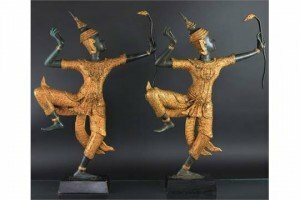 A pair of Burmese gilt bronze figures of the Goddess Ra, modelled with bow and standing on one leg, on ebonized block bases. 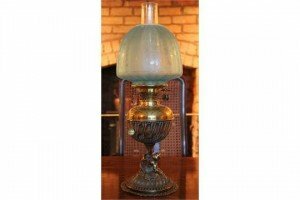 A Victorian brass oil lamp, frosted blue glass shade decorated with butterflies, on a shaped base carved with a putto. 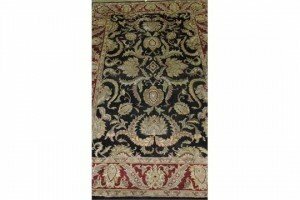 A Tabriz style black ground carpet woven with stylised flower heads within a wide conforming border.